and leading our children to greatness. Practical, innovative, and powerful methods to enliven classrooms and ignite a passion for learning in each and every child. It is time to “GET ON THE DESK” and make every school in America the absolute best it can be. I often say I am a schoolteacher with the heart of a parent. I’ve made it my mission to make a difference in the lives of all of our children. I have traveled throughout our country, visiting schools in all 50 states, seeking out remarkable teachers who inspire our children to greatness. Sadly, I have also witnessed classrooms that seemed sapped of all energy, filled with students struggling to stay awake and teachers in desperate need of inspiration. 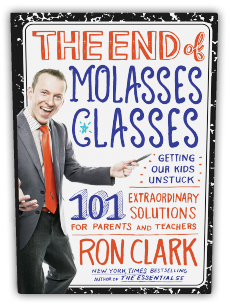 These “Molasses Classes” broke my heart. I had to do something! I decided to leave my classroom in East Harlem, New York, and devote my time to this audacious dream: to create a revolution in our country, starting from the ground up. The heart of this change would be a school, unlike any in the world. It would be full of passion, creativity, energy, and an unparalleled freedom to do whatever it took to lead every child to success. The parents and teachers of this school would forge a true partnership with the intent of providing the best learning environment possible. I am proud to say that dream—the Ron Clark Academy in Atlanta, Georgia, is now a reality. We welcome educators from all over the world to visit and learn from our methods and techniques so that they may take them back to their schools. I am still teaching, every day, and I feel honored to have hosted more than 10,000 educators in my classroom. This book is filled with the magic, the successes, the heartbreaks, the mistakes, and the triumphs that are the Ron Clark Academy. These are the 101 most successful strategies we have used to help uplift our children and enliven our classrooms. My hope is that you will find ideas here that will help you ignite a passion for learning in your children—and together we can get the molasses out of all our children’s classes. Be different. Be bold. Join in.